When rapid adoption of mobile devices began impacting businesses of all shapes and sizes, CARFAX knew they needed to be ready if they wanted to maintain their position as the industry leader of information on used automobiles. Founded in 1984, CARFAX’s core business had been primarily paper-based Vehicle History Reports for more than 2 decades. The rise of mobile, however, presented CARFAX with a golden opportunity. They could provide car dealers and buyers with valuable vehicle history information where and when they needed it most – while they were physically on the car lot. From CARFAX’s initial forays into mobile with VIN-scanning applications for auto dealers and car buyers all the way through to their myCARFAX auto maintenance and Used Car Listings apps, 3Pillar has been riding shotgun as CARFAX’s product development partner. The myCARFAX application, shown here on Android, helps users keep track of vehicle maintenance and has been downloaded 365,000+ times. 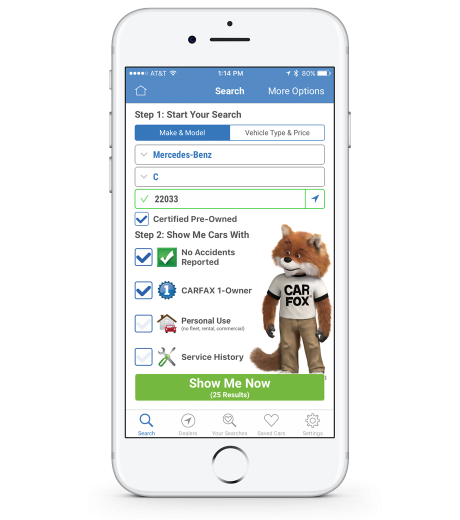 CARFAX's Used Car Listings app for iPhone, which has been downloaded more than 600,000 times since its launch, provides users with a quick and easy way to search used car listings based on a number of criteria. The CARFAX for Dealers app was the first mobile product we helped CARFAX bring to market. It lets auto dealers pull up information on used cars on the lot by scanning the VIN number. To help CARFAX make the leap from a paper-based product to a digital-first organization, we have approached all points of the development life cycle with CARFAX’s customer needs first and foremost. Not only have we worked closely alongside CARFAX to help them launch and iteratively improve upon a number of new digital products over many years, we’ve also helped them foster a deep understanding of their customers that informs their entire new product development process. We believe the results we’ve helped CARFAX achieve speak volumes about the success of our long-term partnership. The myCARFAX app has seen more than 500,000 downloads and the Used Car Listings app has been downloaded more than 1,000,000 times. 3Pillar continues to help CARFAX develop innovative digital solutions for their customers and stay miles ahead of their competition.